An activity is a single, focused thing that the user can do. Almost all activities interact with the user, so the Activity class takes care of creating a window for you in which you can place your UI with setContentView(View). An Activity represents an UI with which a user can Interact. being in multiple different states, as illustrated in Figure . killed, or even launch multiple versions of the application. I have created an application which shows all the states of an Activity and also attached the logs in which we can clearly see and understand about the life cycle of an Activity. onCreate() : Called when the activity is first created. This is first method called when an Activity starts. This is where you should do all of your normal static set up: create views, bind data to lists, etc. This method also provides you with a Bundle containing the activity's previously frozen state, if there was one. generally in this method we write setContentView() method and inflate the XML layout. onStart(): Called when the activity is becoming visible to the user. onResume(): Called when the activity will start interacting with the user. 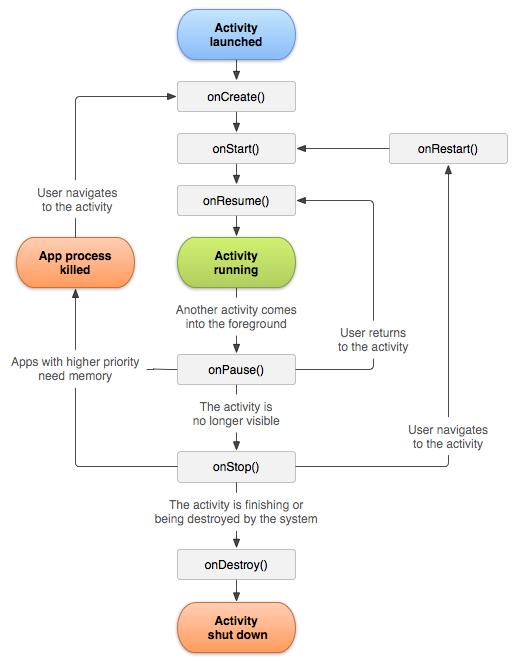 At this point your activity is at the top of the activity stack, with user input going to it. onPause(): Called when when you start a New Activity , the previous Activity goes in Pause state and pushed in stack. When we come back on previous Activity , Previous Activty gets Poped from Stack and onResume() method of previous Activity gets called. onStop(): Called when the activity is no longer visible to the user, because another activity has been resumed and is covering this one. This may happen either because a new activity is being started, an existing one is being brought in front of this one, or this one is being destroyed. onDestroy() : called when the your activity is going to be destroyed. The following Code/Example Illustrate all these things . You can copy the code and run. I have displayed Toasts showing the states of Activity . android:text="This Is Fist Activity Activity"